Fresh herbs and veggies meld their flavors together nicely in this wrapped salad. Basil and mint are cooling herbs, so offer these rolls (halved or whole) at your next summer picnic or barbeque. Soak the noodles in enough hot water to cover for 10 minutes. Drain and rinse with cool water. Dunk 2 sheets of rice paper in a large bowl of lukewarm water and submerge until pliable, about 30 seconds. Layer the two wrappers on top of each other with a half wrapper overlay, and place 1/3 cup of the noodles in the middle. Top with 2 slices of avocado, 1 tablespoon shredded carrot, 1 heaping teaspoon diced chives, and 1 teaspoon each mint and cilantro. 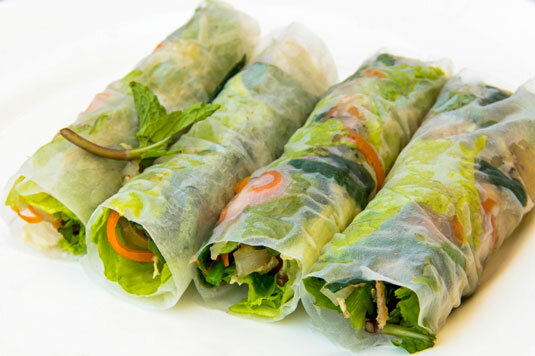 Lay 2 basil leaves on top of the mounded vegetables and roll the rice paper into a tight burrito shape. Repeat with the remaining ingredients until you’ve made 10 rolls total. Serve whole or slice in half. 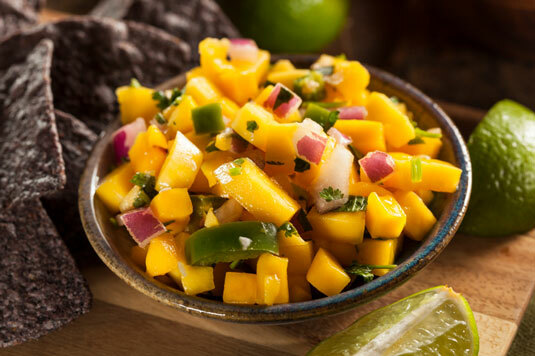 Serve cool with mango salsa and soy sauce for dipping. You can prepare these rolls up to one day ahead of time. Store by laying the rolls in one layer in a flat-bottomed container. Cover the rolls with a thoroughly dampened, but not dripping wet, paper towel. Wrap the container tightly with plastic wrap or top with an airtight cover. Per serving: Calories 411 (114 from Fat); Fat 13g (Saturated 2g); Cholesterol 0mg; Sodium 232mg; Carbohydrate 70g (Dietary Fiber 8g); Protein 5g. Combine all the ingredients in a mixing bowl and stir well to combine. Cover and allow the flavors to marry for at least 20 minutes at room temperature before serving. If not using immediately, cover with an airtight cover or plastic wrap and refrigerate for up to 3 days. Per serving: Calories 78 (4 from Fat); Fat 0g (Saturated 0g); Cholesterol 0mg; Sodium 395mg; Carbohydrate 19g (Dietary Fiber 3g); Protein 1g.